We are proud to serve our church, one another and our local and global communities. By offering a rich diversity of activities, small groups and mission projects, we provide ways for women at all stages of life to connect with one another. Have you wondered what God is calling you to do next? 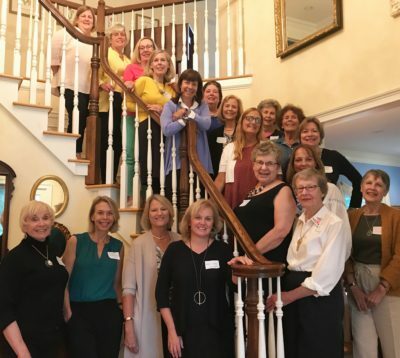 This group of women meets regularly to navigate the next phase of their lives through prayer, fellowship, discussion, and healthy doses of laughter. The group also helps occasionally with church-sponsored mission projects. A number of special events and fundraisers are sponsored by Women’s Ministries throughout the year. Please lend a hand by baking cookies or sorting through “Christmas Treasures” for the Cookie Walk & Christmas Treasures in December, make some homemade soup to sell and help to make Chicken Pot Pies. All proceeds go to mission! In fond memory of our dear friend, Marla. Marla was a long time member of PCCT who exemplified a warm, positive, and generous spirit while serving on many church committees throughout her time here. Her passionate work and leadership as Director of Development and Community Outreach of Morristown Soup Kitchen was her way of selflessly serving a community in need, and she fulfilled this duty with love, true compassion, a fun spirit, and a big smile. The MDMS will be a $1,000 scholarship awarded to any current HS senior or college student, male or female, who is an active PCCT member who exemplifies the same generous, giving spirit to the community as Marla so graciously did. Women’s Ministries has the funds to support this important scholarship for the next two to three years, but we hope to be able to continue it even longer and would be thrilled to make a lasting impact in honor of Marla. If you would like to celebrate Marla by contributing to the scholarship fund, please make checks payable to PCCT, with MDMS noted in the memo line. Thank you! Interested in forming a new group? Might it fit under the category of “Women’s Ministries”? We can help you get started by providing leadership training, resources and help with publicity. Contact the church office for more information.